Florida’s fledgling CBD market just launched but is proceeding at a snail’s pace, with the handful of licensed businesses hoping voters will approve a full-fledged medical marijuana program this fall. For now, the current crop of CBD operators are hedging their bets on expanding their businesses ahead of the Nov. 8 election. 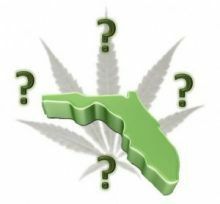 If Florida voters approve Amendment 2 – as the MMJ initiative is called – the state could quickly become the second-largest medical market in the country after California, given its population of 20 million. Many are retirees. “If that passes, that will fundamentally change the market, and they want to be ready,” Sharkey said, referring to existing business owners. The state’s first dispensary opened in July. But the CBD market – established through a 2014 state law – has barely grown. As of Sept. 26, 331 patients and 116 physicians had registered for the state’s Compassionate Use Registry, according to a state health department spokeswoman. Many potential patients aren’t familiar with the program and doctors have been slow to register, fearing it might damage their reputation or result in the loss of their license, industry observers said. On the upside, the largely untapped market has plenty of room for expansion. “It’s a growing climate,” said Kim Rivers, CEO of Trulieve, which opened Florida’s first dispensary in Tallahassee on July 26 and its second in Clearwater on Aug. 18. Rivers estimates her company has about 80% – or about 260 – of the state’s patients. The industry’s future rests in the hands of Florida voters. They will vote on a measure that would create a new medical marijuana program – one far less restrictive than the existing program. Under the current program, dispensaries can sell only vape oils, capsules, and tinctures. At the same time, only terminally ill patients who have one year or less to live are eligible for THC-dominant products. Patients suffering from cancer, seizures, or epilepsy are eligible only for CBD-dominant products. The current program also requires patients to have a 90-day relationship with a physician before they’re eligible to receive an MMJ recommendation. Florida dispensary officials argue that 90 days is too long in general, but is an especially onerous demand to make of terminally ill patients; some may only have a few months left to live. “We’re all learning that this program is not as efficient at it could have been,” Sharkey said. Aside from creating one of the largest MMJ systems in the country – one that could include out-of-state entrepreneurs – Amendment 2 would expand the list of MMJ conditions to include: glaucoma, HIV/AIDS, post-traumatic stress disorder (PTSD), amyotrophic lateral sclerosis (ALS), Crohn’s disease, Parkinson’s disease, multiple sclerosis, and other “debilitating” medical conditions. Until November, companies are limiting their dispensary construction plans and other expenses. Consequently, what little business companies are doing is being done through deliveries, which are allowed in Florida. Rivers said at her busiest location, in Clearwater, business is split 50-50 between delivery customers and dispensary customers. At Trulieve’s Tallahassee location, 95% of sales are through deliveries, Rivers said. Surterra Therapeutics, which went online in August, is also doing mainly deliveries, said spokeswoman Monica Russell. Russell added, however, that if Florida voters pass Amendment 2 Surterra would be ready to accommodate the increased patient number. Russell noted that Surterra’s best-selling products have been tinctures. Capsules were selling best at Trulieve, Rivers said. Besides Trulieve and Surterra, another four nurseries are growing and extracting oil from cannabis, and they are expected to have their dispensaries up and running by year’s end. Earlier this month, a Florida administrative law judge rebuked the state’s department of health and recommended the agency issue a seventh medical CBD production license to an applicant who wasn’t awarded a permit last year. While CBD businesses are holding off on infrastructure spending, they are investing time into outreach to physicians and potential patients. Many physicians and possible patients still don’t know the program exists or how to access it, industry observers said. For example, Rivers and a few Truelieve colleagues spent last weekend at a convention of the Florida Osteopathic Medical Association, introducing themselves to osteopaths and telling them about the program. Rivers estimated there were about 600 people at the conference, and her team “had great conversations” with about 100 of them. But industry observers acknowledge that convincing doctors to get certified to recommend medical marijuana has been an uphill battle. That’s partly because many doctors worry that getting certified to recommend MMJ might tarnish their reputations – or, even worse, result in the loss of their medical licenses. “A lot of doctors are not ready to recommend,” Russell said. The market has also introduced new opportunities for patient fraud. Rivers said her dispensary has received several phone calls from potential patients saying they’ve read or heard of companies that can help patients obtain medical cards. Florida, however, doesn’t have a card system; rather, dispensaries track patients through the Compassionate Use Registry. Despite the challenges, Florida dispensary officials said they’re prepared to wait out the current slow market until things change. Florida is a corrupt state where the people who wrote the bill made certain only 5 or 6 applicants (themselves) would qualify to get the license; such as being a nursery in business over 30 years etc etc.